John R. Christy is a professor of Atmospheric Science and Director of the Earth System Science Center at the University of Alabama in Huntsville. He’s a vocal critic of climate change models and has testified on numerous occasions against the mainstream scientific views on man-made climate change. Christy has affiliations with a number of climate science-denying think tanks, including the Heartland Institute and the Cato Institute. And now Andrew Wheeler has appointed him to serve on the U.S. Environmental Protection Agency’s Science Advisory Board. Professor Christy is an excellent choice for EPA’s Science Advisory Board. And if you doubt me, please read the quotations below that DeSmogBlog has put up on its website to purportedly discredit EPA Secretary Wheeler’s choice. Christy’s views are mainstream in the world that most of us live in. The above quotations are neither radical nor errant. They are middle-of-the-roadish. John Christy knows that the climate changes and humans have a warming impact (good news indeed). 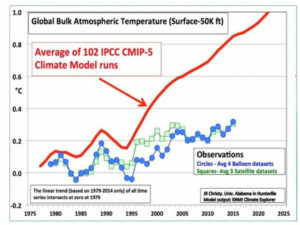 And yes, the climate models are overpredicting real-world warming, a divergence that is growing, not contracting, as his iconic graph shows. If Professor Christy sounds like a rational scientist working in a very unsettled field, you are correct. No “pretense of knowledge” here. Compare him to the know-it-all alarmist climatologists such as Andrew Dessler at Texas A&M, whose challenge to Texas Gov. Abbott was critically reviewed last week at MasterResource. A polite, learned scientist, John Christy has to be among the most likeable physical scientists you will meet. (He was a star at a Houston Forum Climate Summit back in 1999, another story.) May America get to know him better in his new role. Dessler, Introduction to Modern Climate Change (Cambridge, UK: Cambridge University Press, 2nd ed., 2016), p. 146 (his emphasis). Rob Bradley is the editor of Master Resource, well worth adding to your bookmarks. T=A*sin(1.6732*t) + 0.01277*t – 25.488 [where T is in Celsius and t is in years], with the only exception that the nature shifted one peak from 2013 to 2016. 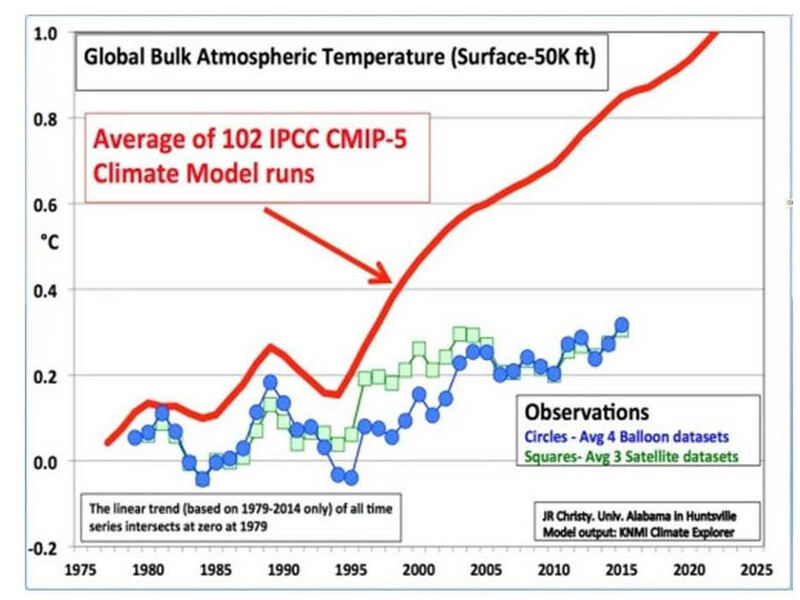 There must be an unknown periodic natural oscilation combined with AGW of 1.3 deg per century.